EDITOR'S NOTE: Nathaniel Hawthorne was already a man of forty-six, and a tale writer of some twenty-four years' standing, when The Scarlet Letter appeared. He was born at Salem, Mass., on July 4th, 1804, son of a sea-captain. He led there a shy and rather sombre life; of few artistic encouragements, yet not wholly uncongenial, his moody, intensely meditative temperament being considered. Its colours and shadows are marvelously reflected in his Twice-Told Tales and other short stories, the product of his first literary period. Even his college days at Bowdoin did not quite break through his acquired and inherited reserve; but beneath it all, his faculty of divining men and women was exercised with almost uncanny prescience and subtlety. 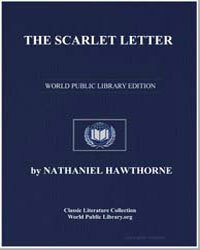 The Scarlet Letter, which explains as much of this unique imaginative art, as is to be gathered from reading his highest single achievement, yet needs to be ranged with his other writings, early and late, to have its last effect. In the year that saw it published, he began The House of the Seven Gables, a later romance or prose-tragedy of the Puritan-American community as he had himself known it - defrauded of art and the joy of life, starving for symbols as Emerson has it. Nathaniel Hawthorne died at Plymouth, New Hampshire, on May 18th, 1864.